I'm starting something new around here! 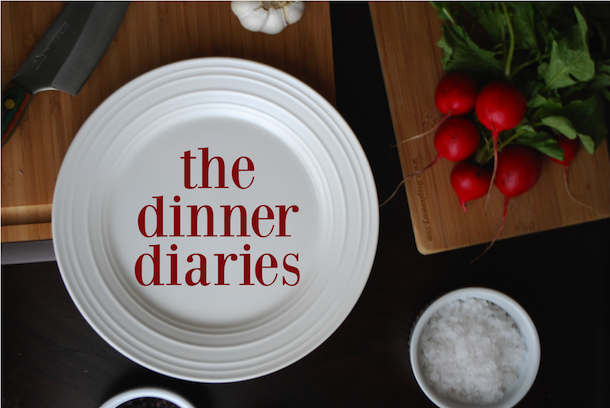 It's called The Dinner Diaries, and it's going to be a series of posts chronicling what I've made for dinner on random evenings. The posts will consist of a casual snapshot or two taken while cooking or just before sitting down to eat, a few brief sentences about the dish, and either a recipe or a brief rundown of what I did to create the dish. I'm always making things that I want to share here, but don't because of the lack of natural light or because it's not particularly photogenic or because I just kind of winged it and didn't really write down the recipe as I made it. But I'm going to challenge myself to be a little bit more relaxed and just share, because I think it will help you to see the kinds of things I make most days. And maybe you'll be able to try them too, or just get ideas for ingredients or combinations or techniques you can try in your own kitchens. Oh...and I'm not even going to limit it to dinner. Because sometimes I make random delicious things for lunch or for breakfast or for a snack, and those deserved to be shared, too. But I like the alliteration. So that's the plan for The Dinner Diaries. Just simple, straightforward, what-we're-eating-tonight (or whenever) kinds of things. P.S. My first Dinner Diaries post will be up later featuring last night's lamb shanks. P.P.S. I'm obviously going to continue with my other kinds of posts, too.